Chocolate is quite magical for raising the spirits. Apparently, there are over 380 compounds within chocolate that have profound effects on your brain chemistry and produce similar sensations to what one would experience with love and courtship. Is it any surprise that love and chocolate often go hand in hand? Naturally, I can't help but feel inspired to create a special treat for you to show loved ones how much their kindness and love means to you. These truffles are easy to make, rich in flavor and ever so decadent. Best of all, these beauties are completely healthy. Indulge happily!!! Heat the semisweet and bittersweet chocolates in a double boiler over medium-low heat until the chocolate melts. Fold in the condensed milk until the mixture has a consistency similar to marshmallow fluff. Turn off heat. Add the vanilla extract. Remove from the stove, cover and refrigerate for approximately four hours. The mixture needs to be firm. This can also be made a day ahead so that it sits in the refrigerator overnight. Line a cookie tray with either a silicone baking mat or parchment paper. Take the bowl out of the refrigerator. Let it come to room temperature. The chocolate needs to be soft enough to scoop out with a melon baller or spoon. Roll each truffle to be 1/2 – 3/4″ in diameter. Place on lined cookie sheet as you complete each. Wash hands and dry thoroughly. Place one cup of cocoa powder into a medium bowl. Dust your hands with cocoa powder. Now drop each ball into the cocoa powder and dust until well-coated. Place each ball on the cookie sheet as you prepare. After all of the balls are rolled and dusted, place the cookie sheet into the freezer for approximately 15 minutes so that the balls can firm up. 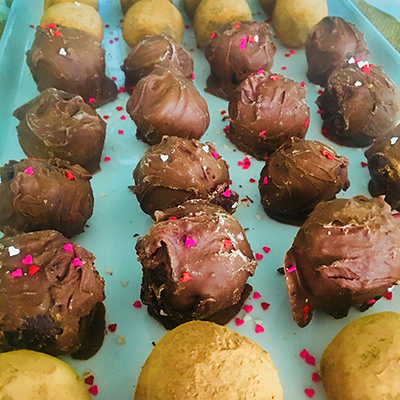 You can also make some milk chocolate dipped truffles if you would like. Set aside some of your rolled and dusted balls. Melt the milk chocolate chips in a glass bowl using the microwave on low heat. Drop each truffle into the melted chocolate. Using a fork lift each truffle out of the bowl and place on the cookie sheet. use a toothpick to cut away excess chocolate formed around the ball. You must work very quickly if doing this method because the milk chocolate will harden again easily. Dash Heart Sprinkles over top so that they stick to the almost hardened truffles. Serve truffles immediately or can be stored in the refrigerator for up to one week. This sweetened condensed milk alternative is very easy to make and the flavor is unbelievable! It's literally so creamy decadent that I almost forget that it's actually dairy-free. All ingredients should be room temperature before starting. I recommend to use a Vitamix blender. However, if you are using a regular blender then you will want to drain the water from the cashews beforehand. Place the cashews as well as all other ingredients into a blender. Blend medium-high. Scrape down the sides of the blender as needed. Store in a sealed glass jar until ready to use (can store up to three days). Note: If you don't plan to use same day, then you may wish to rewarm slightly prior to use so that the blend thins slightly. Place the cashews and oats in a Vitamix blender. Blend at high speed until the mix has the texture of a fine powder. Be careful not to overland so that our mixture doesn't turn into cashew butter. Add maple syrup and vanilla. Blend using short blitzes until the ingredients are combined well. Place the mixture in a bowl. Stir in the chocolate chips using a spatula. If your dough feels sticky, then flash-chill it in the freezer for 5 minutes. This helps make it easier to work with. Scoop out with a melon baller or spoon. Roll each truffle to be 1/2 – 3/4″ in diameter. Place on lined cookie sheet as you complete each. Wash hands and dry thoroughly. After all of the balls are rolled, place the cookie sheet into the freezer for approximately 15 minutes so that the balls can firm up. Next Post Can Romance Only Happen In Fairy Tales?